MarineShaft has a wide range of equipment and many years of experience in repairing damaged propeller blades and fixed propellers. We rebuild damaged propeller blades in stainless steel and bronze, and we are able to balance the propellers statically with specially designed digital equipment. All jobs are carried out with approval from the classification societies. 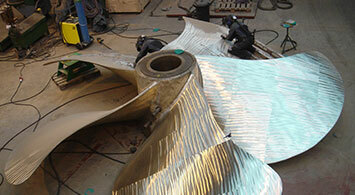 Jobs are carried out in our workshop or on-site. Our certified welders are ready to take of 24/7 alone or in teams. We have a fully equipped container, ready to be shipped out to propeller repairs world-wide. 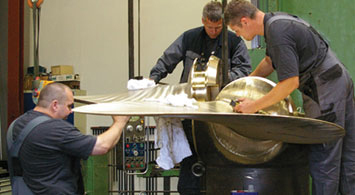 Jobs are carried out in our workshop or on-site. We have a fully equipped container, ready to be shipped out to propeller repairs world-wide.